Wayne Simmonds thinks about those days a lot - the days long before he skated in his first NHL game, and years before he was drafted in 2007. For as much as hockey was a big part of his life growing up, so too was an understanding and appreciation of community. Simmonds has never forgotten that. 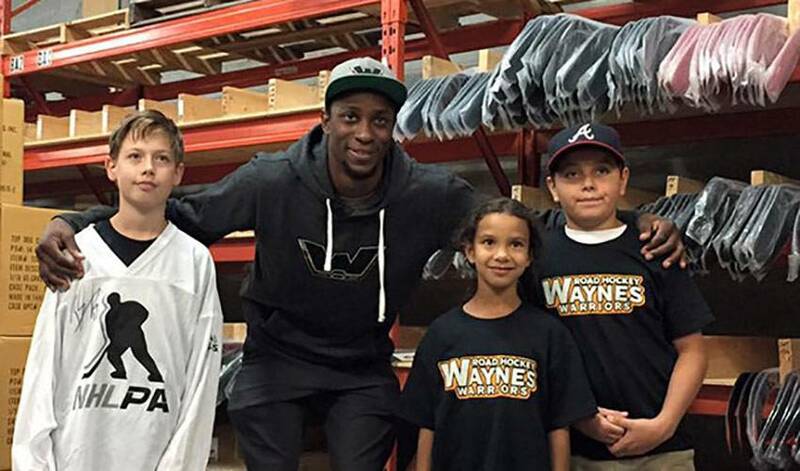 In fact, it was what prompted he and a friend to create Wayne’s Road Hockey Warriors (WRHW), an annual charity event launched in 2012 that takes place in Scarborough, Ontario, his hometown, and the place where his path to an NHL career began. Every summer, a mix of professional hockey players and kids share the same space, joining together for a ball hockey tournament that continues to grow in profile and popularity. Committed is indeed an apt word to describe the man behind it all. So, while hockey is indeed the showcase of his charitable endeavor, Simmonds will tell you it’s much more than just a celebration of the game. The WRHW tournament affords kids between the ages 8 and 12 the chance to participate in a sport they may not have had the ability to play before. Playing the game since he was five, Simmonds wanted to reciprocate the support he received as a kid from the local hockey community. Over the years, he’s worked with the NHLPA’s grassroots hockey initiative, Goals & Dreams, in an effort to connect more Scarborough kids to the game. Recently, in partnership with Goals & Dreams, he helped outfit kids with new equipment. “To have that helping hand, to see what it means to these kids, it’s just amazing,” said Simmonds. “The support from the people of Scarborough, the sponsors, the players that come out each year for the tournament – it is unbelievable. It’s really a great community. I still have a lot of support, like I did when I was growing up, and I always wanted to repay the kindness that I was given. And, if you’re Wayne Simmonds, you don’t forget where it all started.